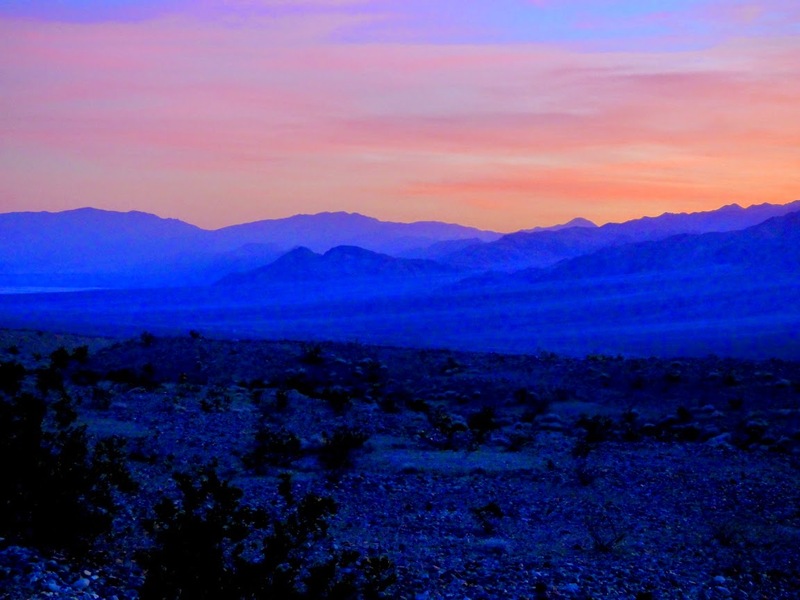 Is there an empty quarter of Death Valley National Park? An area so isolated that tourists are almost never found there? The short answer is: of course. Much of the park is near-primeval wilderness, roadless and untrammeled, and largely devoid of humans. That's as it should be. We need to have these kinds of places, a reminder of the natural world where humans haven't mucked everything up, places that have value measured in something other than dollars. Places like Badwater, Furnace Creek, and Dante's View are popular tourist destinations, and are certainly wonderful places to visit. But in my travels I like the places that feel like the end of the road, the entrance portal into a wild and even dangerous world. 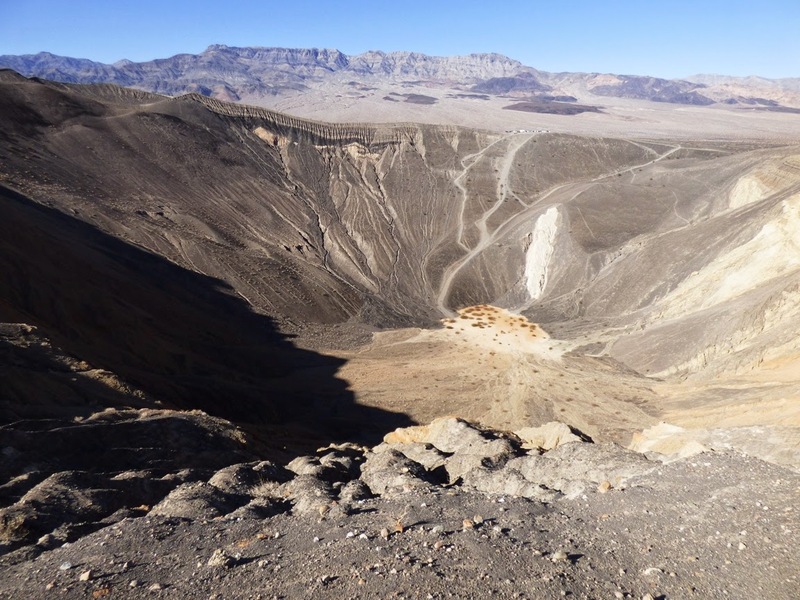 One of those kinds of places is Ubehebe Crater at the end of the paved road in northern Death Valley. 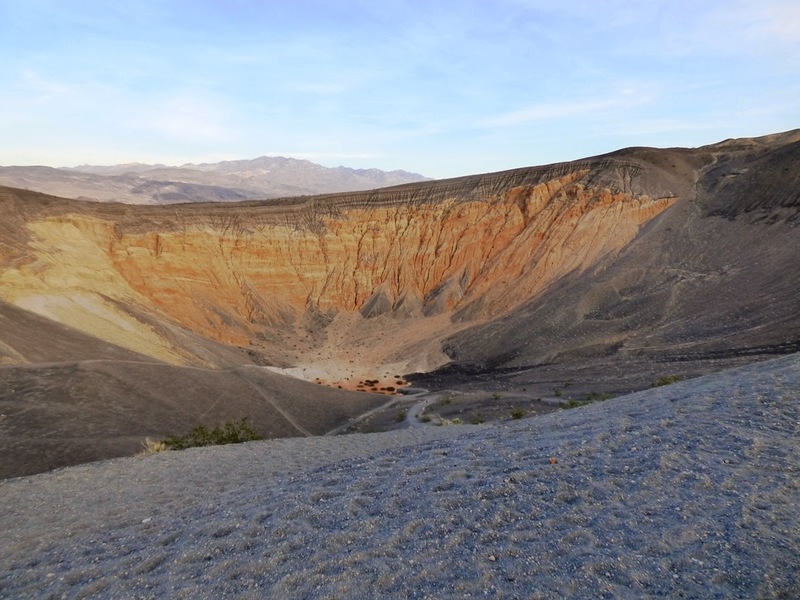 Ubehebe Crater is part of a volcanic field that includes a number of basaltic cinder cones, and seven or so phreatic (groundwater) explosion pits called maars. The volcanoes are quite young, with some that erupted as recently as 800 or so years ago (though the dates are still being debated). The biggest crater is 750 feet deep and half a mile across. The groundwater explosions were caused when magma approached the surface, heating the water and causing it to flash to steam. Dozens of explosions would have accompanied the formation of each crater. 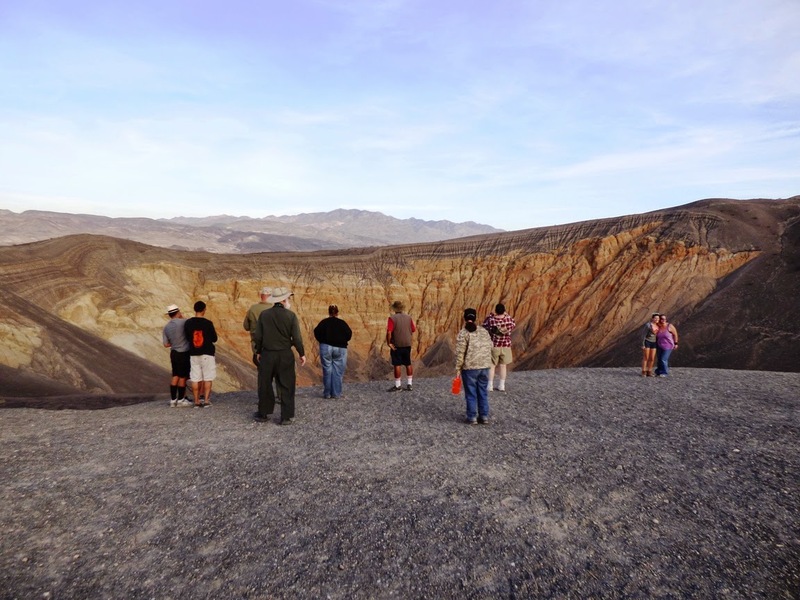 The craters are a fascinating destination for Death Valley travelers, although few make the effort unless they are also going to Scotty's Castle. Walking to the bottom of the crater is one way to gain an appreciation for the power of exploding magma. So is a walk around the biggest crater. In the picture above, the cars in the parking lot on the opposite rim are barely visible. But the reason I love stopping in at Ubehebe is the sense at being at the edge of the wilderness. The pavement ends, and only gravel roads continue, towards Racetrack Playa in one direction, and the distant town of Big Pine in the other. The lands seen from the edge of the crater rim feel like terra incognita. It's wild, lonely country. 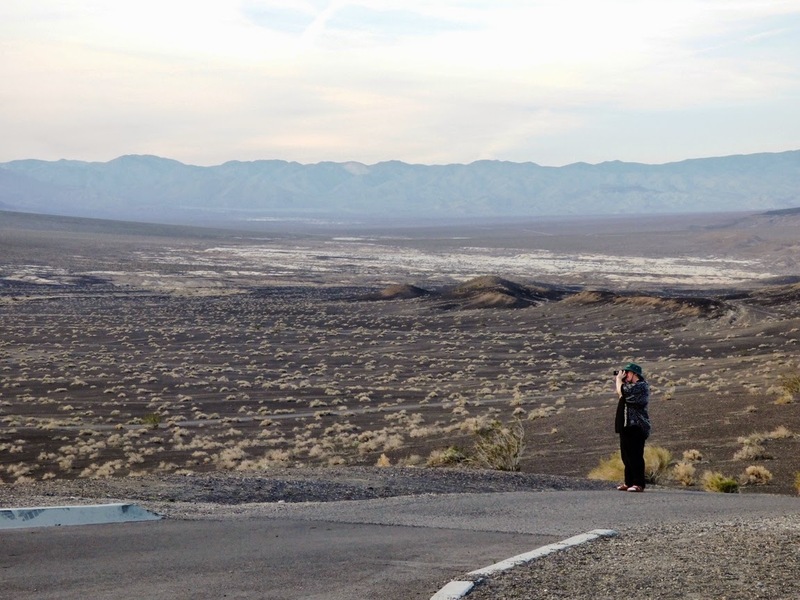 The fourth day of our recent journey to Death Valley was devoted to an exploration of the north end of Death Valley, with stops at Bonnie Claire Playa and Ubehebe. The day was ending as we drove back down the valley towards Stovepipe Wells, but the sky was gorgeous. After 30+ plus trips to Death Valley I finally made it to Ubehebe last year. Stunning place. Did Darwin Falls on the same trip and had a guy tell me half way out "it's ok." Dude, it's a waterfall in the middle of the driest place on earth! Racetrack will hopefully happen this year. "Walking to the bottom of the crater is one way to gain an appreciation for the power of exploding magma. ...but walking back up it (or trying to) gives one serious appreciation for his headlong stupidity. It's roughly 1.5 steps backwards for every step forwards.